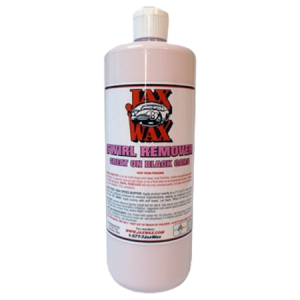 Jax Wax Body Shine Showroom Spray Wax is a simple “Spray and Wipe” quick detailer that brings a vehicle from “Driver” to “Showroom Fresh” in minutes. Makes your finish appear deeper, richer and more sparkling. 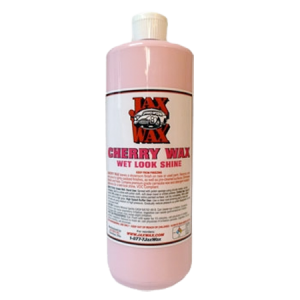 - To Restore that “Pop” and go from Driver to Show Car.When used with a Microfiber Towel, Jax Wax Body Shine Showroom Spray Wax will safely remove light dust, dirt, road grime and water spots from your finish without scratching. Jax Wax Body Shine Spray Wax gives that “just detailed” glossy look to any finish, including paint, glass, and chrome. It will leave a slick and glossy finish.Unlike most spray waxes, Jax Wax Body Shine Spray Wax will not streak and smear in high heat and humidity. In fact, we have shown many classic car owners at car shows how Jax Wax Body Shine Spray Wax cleans up the mess other products left behind. There is nothing more disappointing than trying to improve your vehicle’s appearance only to make it worse!If you want to, you can use Jax Wax Body Shine Showroom Spray Wax in the direct sunlight – even on black paint! We prefer to use a black or dark colored finish on a vehicle at shows. Right out in the direct sun on a hot surface. Black or dark colored painted finishes show everything! There is no better way to demonstrate how easy this wax is to use and the finish that it will create. If you can create an awesome “Black” finish without any streaks, hazing, smears or dust – you can replicate that on virtually any other finish hands down. Our commercial customers use Jax Wax Body Shine Spray Wax to make showroom cars “pop” on the showroom floor and for final touch up prior to delivery. A fair number of other customers use this product at home on stainless steel kitchen appliances and mirrors. Jax Wax Body Shine Showroom Spray Wax is perfect for show cars, motorcycles, race cars, and cleaning up everyday “drivers” when it doesn’t warrant a full wash. A lot of our customers use it at home on stainless steel kitchen appliances, and on mirrors.Jax Wax Body Shine Showroom Spray Wax also extends the protection of any existing wax that you have on your vehicle.Most people keep a small trigger-spray bottle and a Microfiber Towel handy in their vehicle when they need that quick, 5 minute detail. For best results use a Microfiber towel. Microfiber towels are extremely absorbent and will not scratch your finish. Use on your windshield, glass, mirrors and chrome – the product will not streak and produces an awesome finish. In fact when used on glass, will act as a rain repellent. Spritz the product lightly! You are not adding any more shine or protection by saturating an area, instead you are wasting product and making it more difficult to wipe off. Do not use pressure when wiping. Let your Microfiber Towel do the work. Turn it over frequently. Excessive rubbing and pressure even with a Microfiber Towel can cause swirl marks. 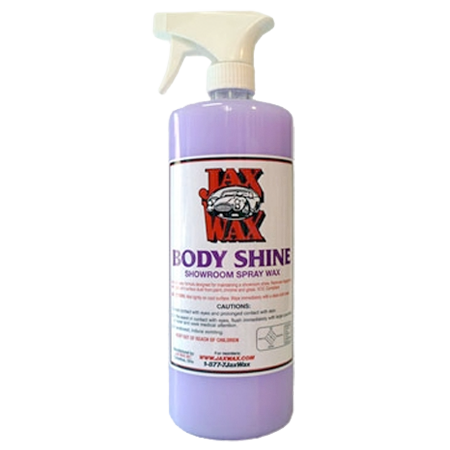 Be the first to review “Jax Wax Body Shine Showroom Spray Car Wax” Click here to cancel reply.